What is Google Smart Lock, Exactly? Google does this thing where it uses bad names for products. Then it re-uses those names for other products, confusing everyone. Such is the case for Smart Lock, which is technically three different things, depending on whether you’re talking about Android, Chromebooks, or passwords. 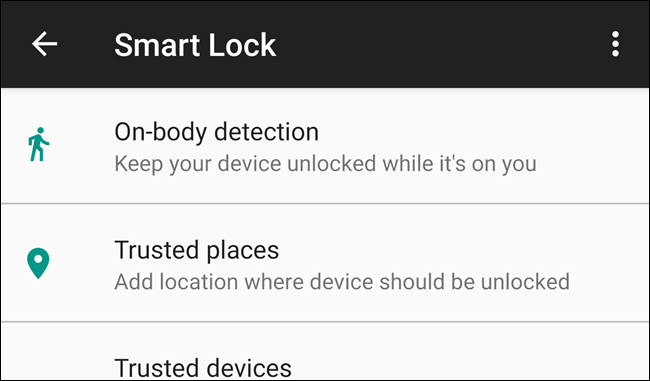 Smart Lock for Android: Keeps your device unlocked when certain criteria is met. Smart Lock for Passwords: Syncs your passwords across Chrome and Android. 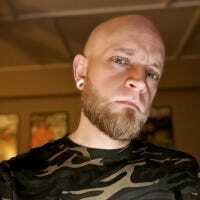 Smart Lock for Chromebooks: Uses your Android device to unlock your Chromebook. So, two of these things are for for device security, but the other is for passwords. It really just…doesn’t make a lot of sense. Here’s a close look at each one. On-Body Detection: Keeps your device unlocked when you’re carrying it. Trusted Places: Keeps your device unlocked in a user-specific geo-fenced area, like home or work. Trusted Devices: Keeps your device unlocked when connected to specific Bluetooth devices. Trusted Face: Like Apple’s Face ID, but bad. 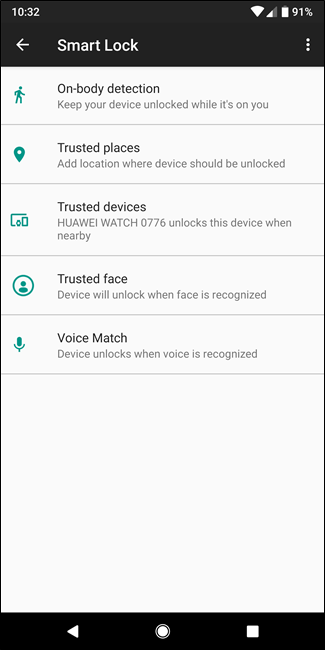 Voice Match: Allows Google Assistant to unlock your device when your voice is detected. Most of these are good ideas in theory, and they work well. On-body detection is questionable, because the device has no way of determining whose body the phone is on—is it your body or has your device been stolen? Not cool. Trusted Places is pretty useful, though it does depend on high location accuracy to be useful. In practice, it can be a bit janky, so your mileage may vary. Of all the Smart Lock features, Trusted Devices is probably the best, especially if you have some sort of wearable. That way you can just define your smartwatch or fitness tracker as a trusted device and as long as your phone is within range, it will stay unlocked. But if your phone were to get lost or stolen, the lockscreen would automatically be engaged. It’s the best of both worlds—secure when you need it to be, but convenient when your phone is nearby. You can find these features in Settings > Security > Smart Lock. We live in a service-based world now, and every service has its own login. As a result, you probably have dozens (or more) of passwords stored…somewhere. Maybe you use LastPass or 1Password. Maybe you try to remember them all (good luck!). But if you let Chrome store your passwords, that’s where Smart Lock for Passwords comes into play: it not only keeps your pertinent information synced across all your Chrome installs, but is now compatible with Android apps. 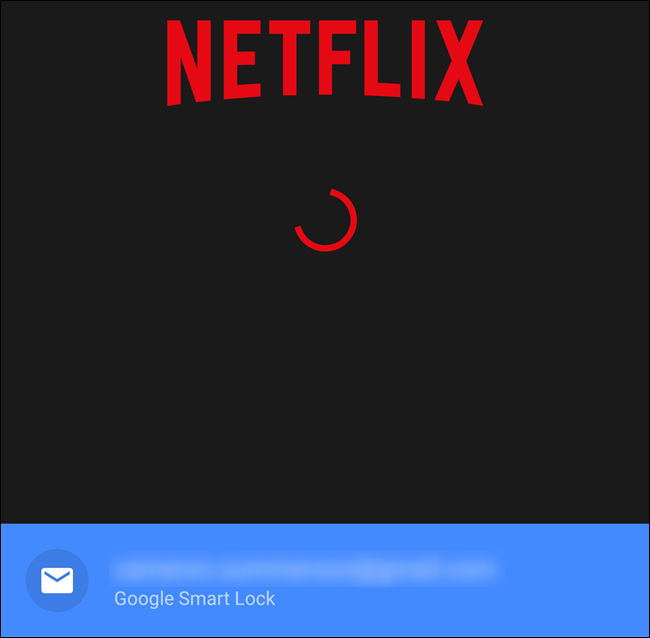 So, for example, if you keep your Netflix password stored in Chrome, Smart Lock will automatically log you into the app when you install it on your phone—no interaction required. You simple open the Netflix app, and Smart Lock does its thing. It’s super convenient. This also works with Android’s Autofill Service, so you can easily log in to apps or websites that may not yet support auto-logins. Smart Lock for Chromebooks is the simplest of all the Smart Lock features, because it only does one thing: unlocks your Chromebook when your Android phone is nearby. It does this by establishing a quick Bluetooth connection with your phone. Because it’s using Bluetooth, it’s also pretty unreliable. In reality, it ends up being faster to type your password (or PIN, if you have that enabled) than to wait for your Chromebook to find your phone and unlock itself. So it’s a good idea in theory, but not so much in practice. If you’d like to give it a go for yourself, you can find it in Settings > Screen Lock > Smart Lock for Chromebook. Make sure Bluetooth is on, otherwise the setting won’t show up. We also have an excellent primer on setting up and using the feature.